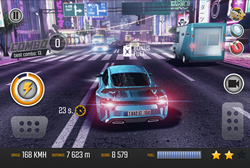 T-Bull, one of the largest companies specialized in mobile games, announced today that its latest title, Road Racing, is available for the iPhone and iPad immediately here https://itunes.apple.com/app/apple-store/id1075850558?mt=8. It will be available later for Android and all major platforms. The latest addition to the T-Bull racing game catalog will be available for free on the app store. Set in the “Top Speed: Drag & fast Racing” Universe, Road Racing delivers a frantic fast-paced, action-packed arcade racing experience boasting exhilarating high speed police car chases, extreme customization with top notch realistic graphics. “When developing Road Racing, we set for ourselves very high standards that required for us to blend our racing genre expertise with the feedback collected from our fans. By listening to the players and drawing upon our technical resources, we forged a racing experience second to none for mobile devices” says Damian Fijałkowski, Co-Founder of T-Bull. Road Racing lets players experience one of the most fulfilling and satisfying traffic dodging experience in the world in an arcade racing environment. Standing in traffic was never an option. Unleash high-octane arcade action on a ticket-earning rampage, break the rules, challenge the odds and play to win. Beat crazy challenges and race in a selection of modified cars. Road Racing will be available free on iOS devices today and in June for Android. The game will be available on all major platforms as Windows or BlackBerry in the future. To download Road Racing, please visit the App Store or visit http://www.T-Bull.com/ for more information. Want to know more? Please visit T-Bull’s Facebook page. T-Bull is one of the largest companies producing mobile games in Poland. Founded by Damian Fijałkowski and Grzegorz Zwoliński in 2010, the studio based in Wrocław, has grown from a five-person team working out of a home office to 40 individuals headquartered in the most famous skyscraper in the country. Their apps have accumulated more than 100 000 000 downloads on Google Play, App Store, BlackBerry World and Windows Store. The gaming landscape is changing and they are at the forefront of free-to-play, defining the new rules for success. T-Bull adjusts its strategy to market conditions and consistently implements it by focusing on the production of mobile games with high production values. The greatest success is Top Speed: Drag & Fast Racing that has already accumulated more than 1 million downloads during first month. The game became a part of mobile game canon thanks to high-quality graphics and exciting gameplay. Their games are downloaded over 250,000 every day.